Salads that will reduce your Cholesterol. Raita to reduce cholesterol. low cholesterol salads. low cholesterol raitas. Salad and Raitas can be quite filling as they abound in fruits and veggies as the main ingredient. To keep them Cholesterol free you just need to avoid the cheese, mayonnaise and cream and instead make use of a variety of dressings to flavor them up. Carrot is great for the eyes.They relieve constipation, lower blood pressure, have fibre and lower cholesterol. Enjoy the Carrot Cucumber and Rajma Salad in Mint Dressing and healthy low cal cabbage carrot lettuce salad recipe. Enjoy this calcium rich paneer aur hare chana salad made from low fat paneer. Cabbage is a heart friendly vegetable, as the phytochemicals present in cabbage have been shown to prevent heart related diseases like atherosclerosis (7) and a decrease in mortality due to cardiovascular disease was observed. Try our healthy low cal cabbage salad recipe. A cup of Parsley is good enough to fill your days need of folate, which helps to reduce homocysteine levels in the body. A high level of homocysteine (which are naturally occurring amino acids in our body) can put you at risk of heart diseases and stroke by damaging your blood vessels. So parsley + onions is great for the heart and incude tabbouleh salad in your diet. Rajma is a complex carb and rich in Fibre which helps in Lowering Cholesterol levels. Soluble fibre may reduce the absorption of cholesterol. Hence lowers total cholesterol and LDL cholesterol (the Bad cholesterol) therefore reducing the risk of heart disease. Enjoy this kidney bean salad recipe towards building your health plan. Make sure you reduce the olive oil a bit in this recipe. Feel free to use any combination of fruits and veggies to make up your salad bowl which is tempting for you more than boring. To learn a few tasty combinations peep into the recipe of Fruity Chana Salad and Grapefruit and Green Apple Salad . Well you can also learn a few unusual yet healthy salad dressing in this section like Muskmelon Dressing, Mint Dressing and Apple Dressing. These low cholesterol raitas use low fat curds and no sugar in them. Try the mint flavoured cooling cucumber raita low cal raita. Lauki aur Phudine ka Raita and Mixed Veggie Raita made from beetroot, tomatoes, cucumber and low fat curds. Try these interesting combinations of textures and flavours as a healthier option for your heart. Enjoy our low cholesterol salads. 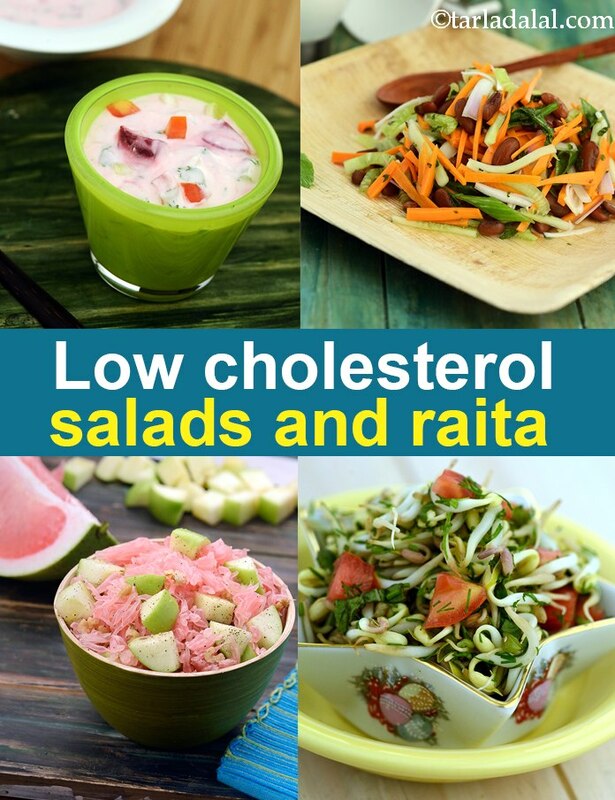 low cholesterol raitas and other low cholesterol articles below.